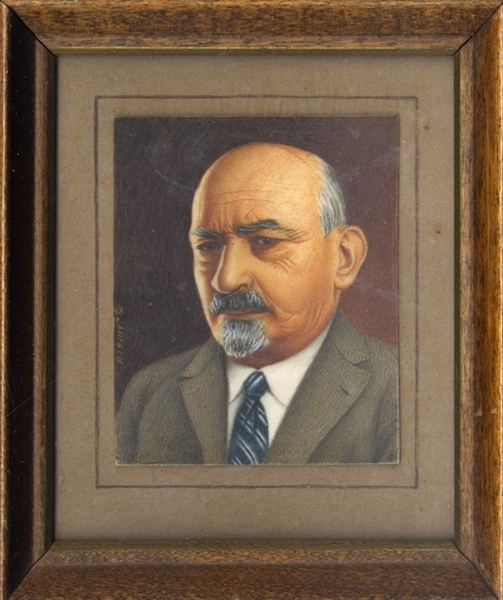 Original Portrait of Chaim Weizmann, signed by the artist as M. Larisch. Realistic portrait, bright coloring, on small artboard2-3/4” 3-1/2” top matted and put in period frame. c1930. (formerly Rex Stark inventory). Chaim Azriel Weizmann (1874-1952) was a Zionist leader and Israeli statesman who served as President of the Zionist Organization and later as the first President of Israel.